The Facebook F8 conference officially kicked off today and yours truly is here! Honestly, I wanted to attend F8 to find out firsthand what the hell is going on with Facebook. 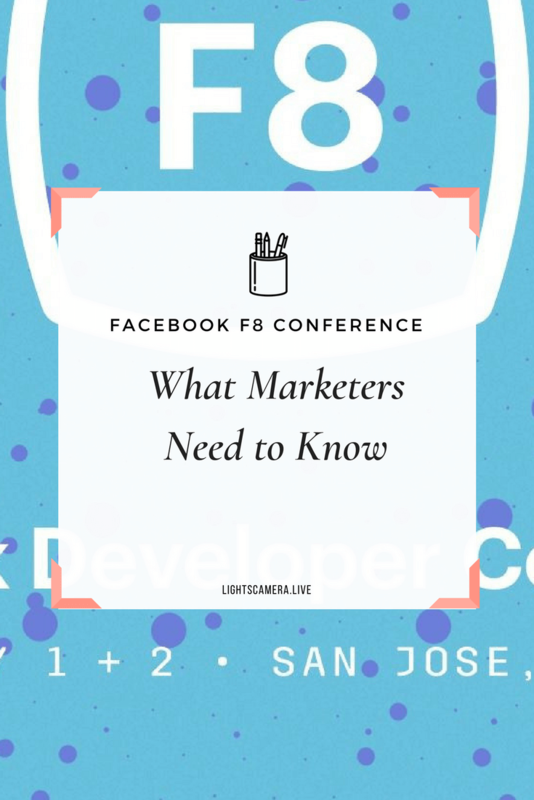 What did Zuckerberg have to say about data privacy and what do we as marketers need to know? Now that the keynote has ended, I can say that Zuckerberg covered everything that I was hoping for and got me super excited about what's in store. I think you'll be excited as well so here's the 411 from a marketer's perspective. APP REVIEWS ARE OPEN AGAIN! So much hard work goes into developing apps and after the whole Cambridge Analytica drama, Facebook had paused app reviews to get rid of bad actors. After today, developers can now start re-submitting apps for review so they can get back into the game. Facebook was slow to identify Russian interference. They were prepared for phishing attempts and hacking during elections but what they didn't expect were coordinated networks creating large amounts of fake accounts to spread fake news. Zuckerberg admitted that Facebook was unprepared but promised that would never happen again. Facebook has deployed new AI tools, took down tens of thousands of fake accounts, and now require large pages running political ads to get verified by uploading a government issued ID. This ad transparency tool has already launched in Canada. Zuckerberg also mentioned that by the end of the year, 20K people will be working on protecting the integrity of the platform. Spam - The playbook for spammers to make money is simple - clickbait. Facebook is taking steps to remove economic incentive for spammers by tweaking the algorithm so that those posts aren't shown in the News Feed. Fake Accounts - Facebook is hiring thousands of content reviewers to find bad actors and immediately remove them off the site. Real People Sharing Fake Content - Ugh, sadly I have people in my family that do this. Facebook is implementing "fact checkers" to debunk fake news that go viral. He mentioned that when users come across articles posted by sketchy publishers, Facebook will notify the user of when the publisher was formed and if any other news organizations have mentioned that publication. With midterm elections in the United States coming up, Facebook is partnering with the Associated Press fact checkers to combat against fake news. What happened with Cambridge Analytica was a major breach of trust - they took data and sold it. Facebook never wants that to happen again. P.S. Btw, did you know that back in 2014, they made changes that restricted sharing your friends' data? Facebook is going to roll out a feature asking all of its users to review their settings especially the apps that they've given permission to access their data. Users will have the ability to clear all of their activity on Facebook - similar to what you can do with your browser history. Even more interesting, you can choose whether or not you want Facebook to keep track of your activity outside of the platform (e.g., websites you visited). Zuckerberg mentioned that clearing your Facebook activity will force the platform to relearn your interests. For those of us that target audiences based on interests, audience sizes could decrease and as a result possibly increase advertising costs. If you're one of the few advertisers that have been able to segment and leverage custom audiences (e.g., email lists), perhaps this won't affect you. I'd imagine if your audience data is all housed on Facebook and you don't have an email list to target then this would definitely impact audience size. 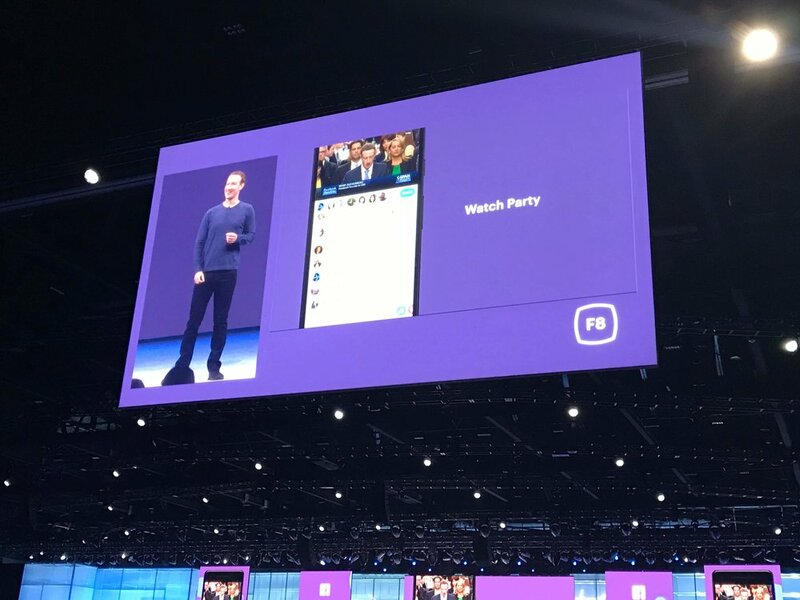 Watch Party - Allows you to watch videos with your Facebook group members so you can experience moments together. Live Commentator - Group Admins or users launching a Watch Party will have the ability to provide live commentary and have their video appear on the screen as picture-in-picture. For the Social Media Strategist Facebook group, I can definitely see us sharing related content and sharing key take aways with one another. Groups Tab - Groups are the most meaningful parts of Facebook and as a result they are going to make Groups more central to the platform. Users will see a new tab where they can interact in groups that they are a part of. In addition, Facebook Group owners will have the ability to add a "Join Group" button to their websites in order to grow their communities. Seriously with all these new features for Groups, are you still on the fence about creating one for your brand/clients? New Explore Design - Users will be able to be a part of community by going beyond the hashtag and following specific Topic Channels. This will give users more control over what they see in the Explore tab. Group Video Chat - Users enjoy live streaming on the platform and wanted this same feature to use with select individuals. Spotify Integration - Want to share your favorite song with family and friends? Now you can. Users will have the option to share a sticker of their favorite song on Instagram which followers can then click on to listen on Spotify. GoPro Integration - Content Creators rejoice! You can now share your GoPro videos in your Instagram Stories. Augmented Reality Filters - Developers will have the ability to create AR filters that users can feature in their stories. Anti-Bullying - To deter cyberbullying, Instagram users can hide users that are promoting hate speech or harassing others. The new Explore will organize suggested content into relevant topic channels, making it easier than ever to browse across your interests, while going deeper into any specific area. Oculus Go is the first standalone all-in-one headset that doesn't need to connect to a computer. It's lightweight and portable and is geared towards making virtual reality more approachable and accessible. In fact, it's going to launch with over 1,000 apps, games, and experiences. Oculus Go will feature three flagship experiences: Oculus TV, Oculus Rooms, and Oculus Venues. Launches this month and will be a totally new way to watch TV. Imagine a ginormous TV equivalent to a 180-inch screen that works like a smart TV. Starting this summer, you can invite family and friends to watch in virtual reality wherever they are in the world. Partnerships for Oculus TV include ESPN, Netflix, Hulu, and Showtime. Users will have the ability to watch 3D movies together, listen to music and play boardgames. Announced a partnership with Hasbro and users can expect baord games such as Boggle, Trivial Pursuit and Monopoly. Imagine being able to view live events in virtual reality such as concerts, sports and even movies. Announced a partnership with NBA, MLB, Lionsgate and AEG. Facebok's first live concert with Vance Joy will be on May 30, 2018. Oculus Go is available for purchase online at their site and on Amazon, Best Buy and New Egg. Single folks will have the ability to opt-in to a dating feature and create a profile that which their friends won't be able to see. Facebook's Safety Check feature has helped more than 3 billion users notify family and friends that they are safe. Facebook is releasing a new feature called "Crisis Response: First Person Accounts" were people can add more context to what's happening during the event of a crisis. WhatsApp is a messenger platform with full end-to-end encryption. Translation: Whatever you send on WhatsApp isn't stored on their servers. Last year, WhatsApp Status (their version of Stories) was released and it's now one of the biggest Stories products with over 450 million daily users. WTF? I need to get in on this. Did you know that more than 200 billion minutes of voice and video calls have been made on WhatsApp? Group Voice and Video Calling - WhatsApp will be able to offer users clear video and voice quality everywhere around the world. Stickers - Now you can express yourself in moments where text won't do you any justice. WhatsApp for Business - Goal is to have businesses to have a presence on the platform and have the ability to manage large volume of messages with features such as Away Messages and Quick Reply features. Facebook is officially re-opening app reviews! For all of you that didn't hop on the ManyChat bandwagon early on, do it now. Not sure how marketers can leverage Facebook Messenger? Check out this episode on Bots Mean Business. Launching peer-to-peer payments - Damn, just thinking about how to integrate this with Messenger Bots. Sharing Rich Media - Users will have the ability to send 4K, 360 photos, HD images. Messenger Lite - Video calling is coming to Messenger Lite. Messenger Kids - Kids can enjoy face filters and AR effects. Parents will still have the option to control who their kids can communicate with on the platform. Customer Chat Plug-in - Imagine being able to embed Facebook's Messenger on your website. Now you can continue chatting with prospective consumers long after they've left your website. Messenger Bots - There are 300K monthly active bots and this year alone, more than eight billion messages have been sent between people and businesses and each month. Seriously after typing that last sentence, I had to pause... is that right? Holy sh*t right? Companies are reporting open rates as high as 90% and finding that Messenger Bot users spend 20% more than other customers. M Translations - Buyers and sellers on Facebook Marketplace will have the ability to have conversations translated with a click of a button. Facebook hopes that this will power connections that weren't possible before. Bringing AR to Messenger - Developers will be able to build native AR experiences. Nike has a bot that integrates AR that users can unlock with an emoji password. What?! Did I mention that they're going to be rolling out a new Facebook Messenger Design update? This last part was really interesting. Imagine seeing an interactive 3D post of a product in your News Feed. You click on the "Try It" button and all of a sudden you have the ability to bring a 3D object into your world. So for example, let's say Wayfair has a 3D post for a new line of furniture. You click the "Try It" button and now that piece of furniture is floating in your living room. Ladies and gentlemen, AR is where it's at! Enjoyed this post? Show some love and pin this post. Thanks in advance!